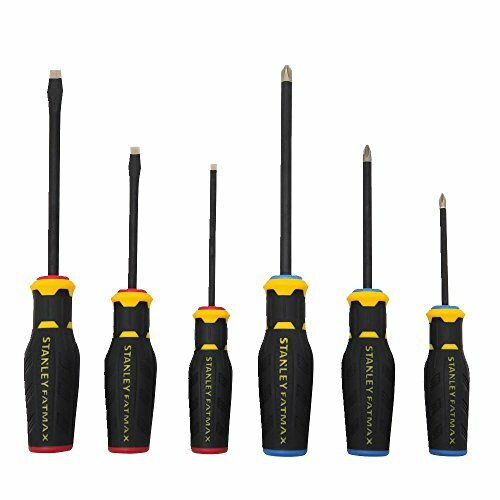 The STANLEY FMHT62052 FatMax Diamond Tip 6 Pc Screwdriver Set are a set to be marveled. With Industrial grade simulated diamond technology on the tip for toughness helps with a longer tip life. These screwdrivers feature an ergonomic quad-lobe design for maximum tip torque, along with magnetic tips for secure grip in fasteners. The black phosphate bars provide corrosion resistance. For on the job easy identification you can rely on our color coded handles. Set includes: 3 Straight Edges, (3/16" X 4", 1/4" X 4", 5/16" X 6"), and 3 Phillips Flat Heads (1PT X 3", 2PT X 4", 3PT X 6").